Truck art, but make it fashion. Shah Rukh Khan with a bowlcut and eyes aflame. A single red rose framed by lurid filigree and even more flowers. So many miniscule details you go cross-eyed tracing. Pakistani truck art is a form unto itself–not easily replicated outside of the country and heavily layered in so many overlapping cultural traditions. 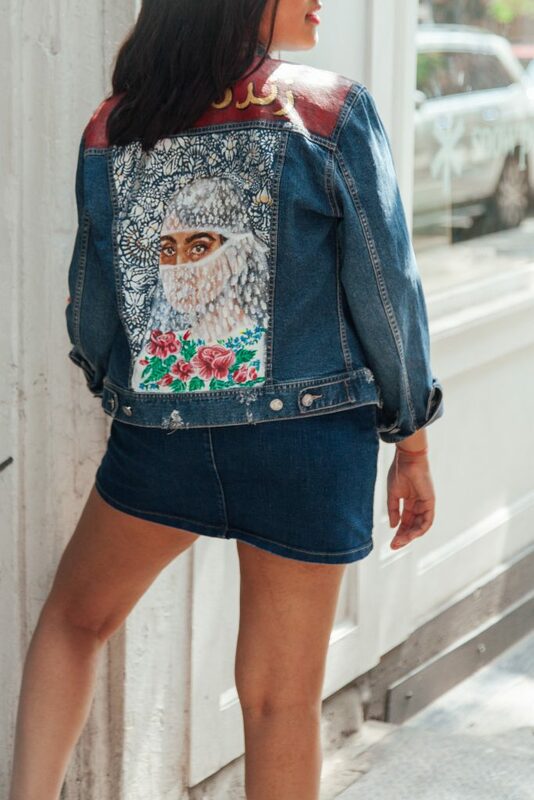 But Chicago-based artist Eliza Karaza is succeeding at bringing it stateside with her hand-painted apparel line. Harakaat Apparel started as a way for Karaza to transfer the art she lovingly made to something more practical and striking. Karaza, who is of a mixed Arab background, is hyper-aware of how Muslim identity is perceived by Americans. Her art heavily features beautiful niquabi-clad women framed by flowers. It is a way to both represent Muslim women well and to make herself visible as a Muslim in an age where hiding might feel more comfortable. Her women are steely-eyed but delicate, full of expression and feeling. Power rests in every stroke of Karaza’s paintbrush. 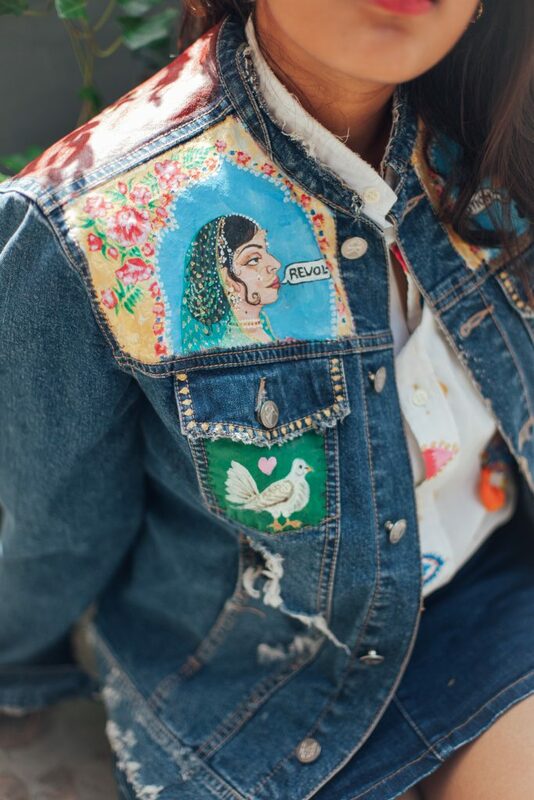 Karaza’s work draws inspiration from a myriad of sources–Pakistani truck art, yes, but also Mughal miniatures, Bollywood advertisements, graphic brands like 5 Pillars, and other artists like Babbu the Painter, whose Bakwaas denim jackets have become a mainstay on South Asian Instagram. And she is definitely extra. 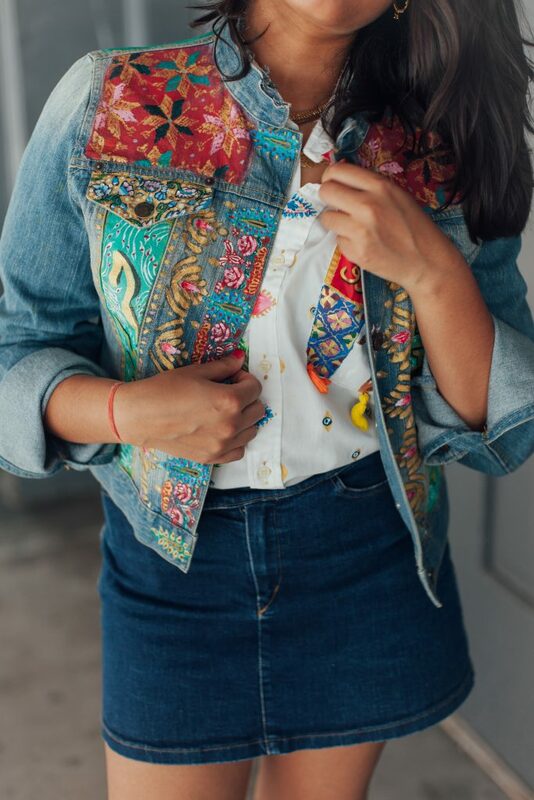 One of Karaza’s jackets might have three unique hand-painted faces on it, each filled with so many details it would be impossible to count them all. Living in India meant Karaza could sponge up all the art around her. Everyday items like ads or walls were places for inspiration. Much of Karaza’s art also features Urdu script and words. Because of her family’s dedication to Pakistani serials, Karaza was spurred to learn the language properly. She can read and write in Urdu and bemoans being better at speaking Urdu than Arabic. 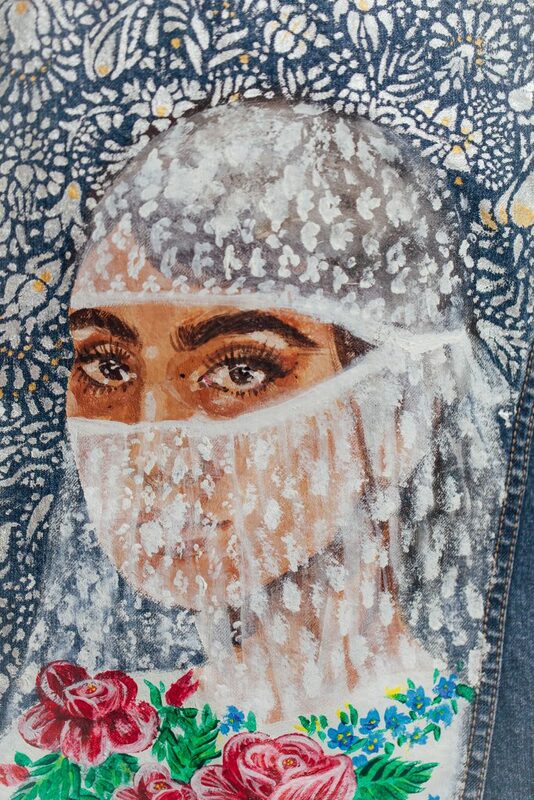 With all the South Asian inspiration she pulls, Karaza is painfully aware of how quickly her work can be deemed cultural appropriation rather than appreciation. It’s difficult to parse the differences in Arab and South Asian cultures when both the SAWANA region and subcontinent pull inspiration from each other. There is shared history, Karaza says, and shared aesthetic. We see it in the way Bollywood borrows melodies from Middle Eastern traditions and how much Bollywood films are loved in the Middle East. Karaza’s art hybridizes what is already overlapping. We talk often about the politics of appropriation. And though Karaza is not South Asian, her dedication to its array of art forms is abundantly evident.We count her among the many brown creators who recognize the porous borders of cultures but treats them with the care they deserve. She is an artist who adores tradition and has the skill to usher it into a new world. Karaza’s work is loving and thoughtful, gorgeously filled with details and ideas that bring old world traditions to the forefront. It’s modern and wearable while also feeling extremely luxurious. To wear one of her pieces is to know that all eyes are on you. 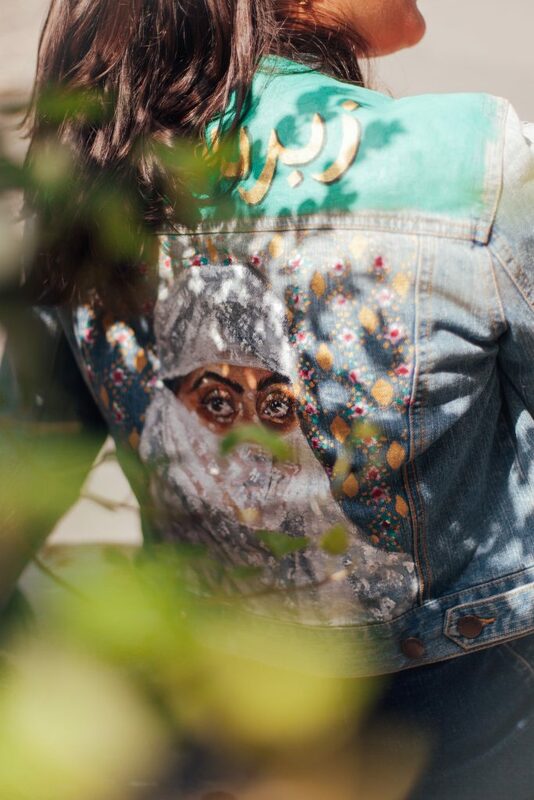 Each jacket, shirt, or sweatshirt is decadent with the love Karaze poured into it.